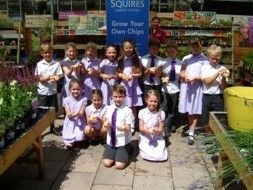 Home • News • Children & Charlie Grow Their Own Chips at Squire’s! 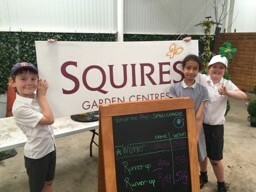 Hundreds of children from schools across the South East have been visiting Squire’s Garden Centres to see how many potatoes they have grown in Squire’s “Grow Your Own Chips” competition. 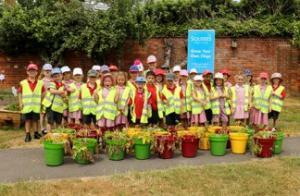 The children originally visited Squire’s back in March, when they were shown how to plant potatoes in a pot and how to look after them. They took their pots of potatoes home then bought them back to Squire’s recently to see who from their school had grown the heaviest potatoes. 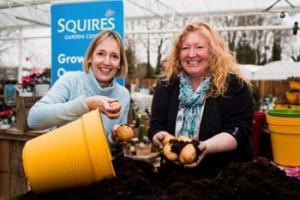 They were also trying to grown more than gardening expert Charlie Dimmock, whose potatoes weighed in at a very impressive 927g! 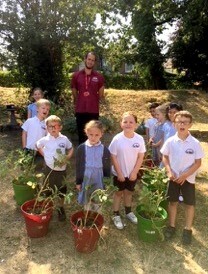 Winners included Lailas from Horsell Junior School whose potatoes weighed 578g, Pearl Starkey and Matilda Brown from Badshot Lea Infant School who both grew 850g of potatoes, and Oliver Thornett from North Downs Primary School who grew a whopping 1.2kg of potatoes! The winning child from each participating school received a certificate and a special prize from Squire’s. Once the weigh-in had taken place, Squire’s turned all the children’s potatoes into chips, and the children loved tucking into them!